Although it's a fictional television show, reality set in last night for many of us Homeland fans who live in Charlotte. The realization that now that the critically acclaimed, award-winning Showtime series has kicked off its fourth season, we will no longer have the pleasure of spotting the Queen City throughout the episodes. As most locals know, since Homeland's inception, the show has largely been filmed in Charlotte, which was used as a stand-in for Washington, D.C. (remember that time "I Sat at the Bar with Carrie and Brody"). We learned in the spring that the series would be moving production out of Charlotte and into Cape Town, South Africa for this season. Well, after three years of calling Charlotte home, a television production as big as this one surely accumulates a lot of stuff. And now, you can own a piece of Homeland stuff. 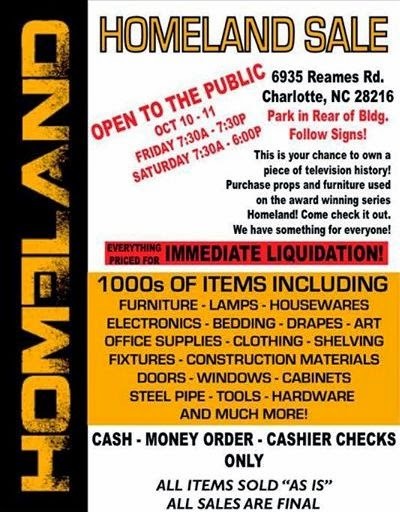 A "Homeland Sale" is being held on October 10 and 11, beginning at 7:30 a.m. each day, taking place at a large warehouse located at 6935 Reames Road in Charlotte, which had been converted into a soundstage by Homeland's producers. According to the advertisement, thousands of items from the show's production are for sale, including furniture, housewares, electronics, office supplies, clothing, construction materials, tools, hardware, and more. Back to the show, last night was a special two-episode premiere that revealed a lot of what we can expect (and the always unexpected) this season from Carrie, Saul, and the gang. And the Twitterverse was fixated on how much Carrie's baby from Brody actually looks like the fictional father. Kudos to @SHO_Homeland for managing to cast a baby to play Brody's daughter who looks like his head photoshopped onto a 5 month old's body. My theory for this season's #Homeland. Brody's baby is turned. Working for Abu Nazir.